The notion of the underworld may be among the earliest conceptions of the spirit world and the soul’s afterlife, perhaps originating in the experiences of Paleolithic shamans in caves. There they undertook vision quests, communing with the souls of animals believed to dwell in the spirit world, recording their visions in artwork on cave walls according to prehistorians David Lewis-Williams and Jean Clotte. Caves were likely the first religious sanctuaries and remains of musical instruments found in them suggest that communal rituals involving music, drumming and dancing were used by the people of the European Paleolithic to induce altered states of consciousness. There are a number of common features of the underworld experience described in the myths of ancient Europe, Egypt, and Mesopotamia that have parallels with the lore of shamanic peoples. The underworld was often imagined as a place of darkness where all familiar sights and memories were left behind. Journeys there by the recently dead, as well as living shamans, often consisted of ordeals in which they faced dangerous obstacles. The shamans of the historical Siberian Kets viewed the underworld as an immense cavern of seven successive layers associated with seven pudak or “obstacles” which shamans had to overcome in their journeys there. This is curiously similar to the the seven gates of the palace of Erishkegal in the underworld as described in Mesopotamian myth, which the goddess Inanna passed through, relinquishing an article of clothing at each gate. The location of the underworld was often believed to be towards the west where the sun set. In Celtic mythology, the islands of the Otherworld were believed to be in the western sea, similar to legends of Native American cultures which also tell of the soul’s journey towards the west. Rivers or similar bodies of water served as liminal boundaries between this world and the next. In legends of the Chumash tribe of California, as well as Babylonian myths, the dead first crossed a river upon entering the land of the dead. In Siberian shamanic narratives the dead travel along the World River to find the entrance to the underworld. In Homer’s Odyssey Odysseus sailed across Oceanus, at the edge of the world to reach the entrance of Hades. There were several rivers in Hades, including the river Acheron meaning“woe”, Phlegeton, the river of “fire”, Lethe, the river of “forgetfulness” and the Styx—the river of “unbreakable oaths”. In the Egyptian Book of the Dead the underworld was imagined as a region of bogs and swamps as well as a “Lake of Fire”, recalling the river of fire in Hades. serpent Apep in the Egyptian underworld were encountered by the wandering soul. During the journey crossroads and bridges were crossed. 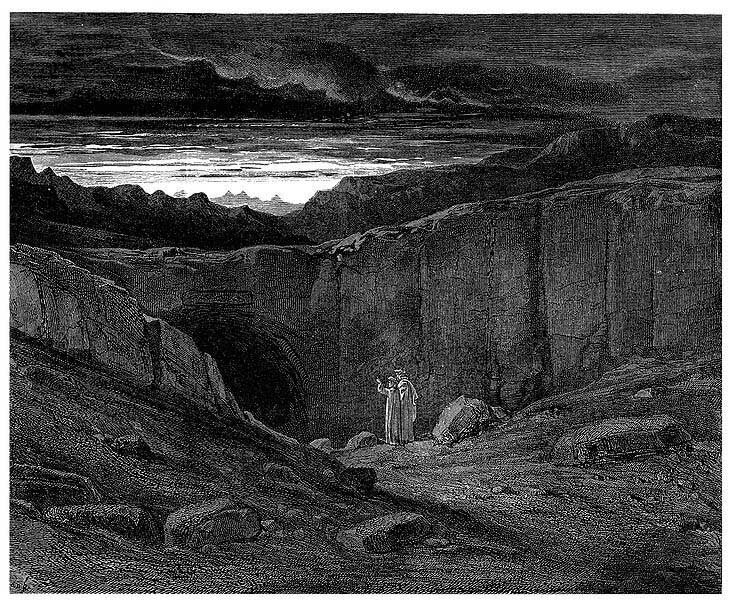 In Hades, souls came to a junction of three roads leading to paradise, purgatory, or hell. The Chumash, as well as the Persians, Germans, Finns and Hungarians envisioned the soul crossing over perilously narrow bridges as part of their afterlife journey. The underworld should not be confused with Hell of the monotheistic religions—a place of perpetual punishment for souls of the wicked. In its most archaic forms it is associated not only with death, but paradoxically with the powers of transformation and rebirth. In many shamanic cultures it is believed the souls of the ancestors live in the underworld as they did on earth, but in a shadow world, awaiting rebirth to this world. Archaeologist Marija Gimbutas writes that people of the Neolithic period saw death as a return to the womb of the earth mother from which they would be born again. According to philosopher Jeremy Naydler, the underworld as conceived by the ancient Egyptians contained the spiritual essence of life—the dormant seeds of all things waiting to spring again to life. They believed the underworld was a place of purification, similar to purgatory, a transitional realm where the soul journeyed prior to entering the Hall of Judgement where the heart was weighed on the scales of justice. If it weighed lighter than a feather, the soul was judged pure and could go on to dwell in the paradisiacal Fields of Reeds, or even ascend to the heavens to journey with the sun-god Ra in his barque of “millions of years”. The Homeric Greeks envisoned the underworld as having three levels—the Elysian fields, the paradisiacal afterlife abode of good souls such as philosophers, heroes and initiates, the Asphodel Meadows, a joyless realm of ghosts where average souls dwelled, and Tartaros where evil souls were punished for their crimes. In some Siberian accounts, the souls of shamans were taken to the underworld during their initiation ordeals, where they were dismembered and fed to the demons of disease, or destroyed and reforged by blacksmiths in subterranean fires. These gruesome visions were part of the dissolution of their former ego-identity, a symbolic death-rebirth experience preliminary to gaining a new spiritual identity and acquisition of shamanic powers. Similarly, in myths of the ancient Mediterranean world, deities and heroes descended to the underworld to undergo ordeals involving death and rebirth: In Sumerian myths Inanna descended to the underworld palace of Erishkegal, where she was killed and hung on a hook before being magically revived. The Egyptian sun god Ra nightly sailed through the underworld in his barque, battling with the serpent demon Apep, prior to being reborn the next dawn. The Greek goddess Persephone was abducted by Hades to the underworld, where she lived during the dark half of every year, returning to the surface world to bring fertility and growth. These stories were celebrated by initiates of the ancient mystery religions as part of their sacred rites. In Egypt, funerary texts such as the Egyptian Book of the Dead were studied by initiates and used for visionary journeys to the underworld, similar to the shaman’s, according to Naydler. 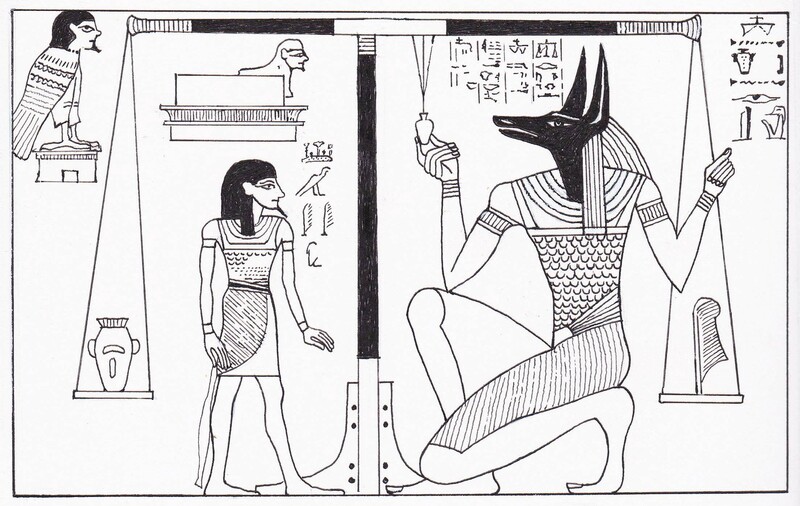 He insists that familiarity with the underworld was essential knowledge of the Egyptian priest-magician, and mastery of its psychic energies were necessary on the path toward spiritual attainment. In the Eleusinian Mysteries of ancient Greece, initiates experienced a spiritual catharsis during dramatic re-enactments of Persephone’s descent to the underworld. The mystery rites overwhelmed their senses and transformed their identity–bestowing direct experience of life after death. They emerged from this experience “reborn” into a spiritual awareness. The fear of death no longer held sway over their lives and existence was pervaded with a sense of the sacred. Cicero writes on the importance of Eleusis: “We have been given a reason not only to live in joy, but also to die with better hope”. One of the roles of the shaman is psychopomp—the guide of the dead—who is called to journey in vision to the underworld, escorting the souls of the dead to their new home, as well as retrieving the souls of the living who have strayed there or were stolen by spirits or sorcerers. In ancient Greece, shamanistic magicians known as goetes attended funerals as professional mourners. They also specialized in escorting the souls of the dead to Hades, as well as offering sacrifices to the restless dead so they would leave the living in peace. In Greek myth, the poet Orpheus descended to the land of the dead to rescue the soul of his deceased wife, Eurydice, which he actually succeeded in doing according to early versions of the legend. Post-Jungian psychologist James Hillman points out that the word Hades means “riches” in Greek, and was understood to be the wealth contained literally and metaphorically deep within the earth. Hillman insists that by exploring the underworld of the unconscious, we can discover its inner riches. He suggests we experience the myths of the underworld from ancient cultures “psychologically” to bring awareness to the depths of our psyche—its dreams, irrational moods and fantasies. An important part of the training of the modern magician or shaman should consist in exploring the underworld of the personal unconscious, in order to become aware of one’s shadow self. This involves an examination not only of one’s fears, repressed emotions and psychological projections, but also dreams, fantasies and suppressed creative potential, essential to becoming a more balanced and whole individual. Following this, the ancestral underworld should also be explored through myths, folklore and visionary journeying, as it is a place of ageless wisdom and regenerative power. Carl Jung sums it up: “One does not become enlightened by imagining figures of light, but by making the darkness conscious”. The underworld and its powers of transformation and rebirth should not be feared–they are the roots of the tree, essential to anyone treading a spiritual path.